On May 6, 2017, I ran my first 5k since having my baby boy in March. This also was my first 5k since last July 4th. Shortly after that race I found out that I was pregnant and decided to stop running. After having my son in early March I was eager to get back to running. 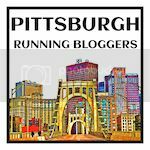 I also knew that the Pittsburgh Marathon was fast approaching and I would love to be involved in some way! The 5k seemed like the perfect fit! I decided to take the approach that I would run/walk the race. Along with the challenge of actually physically being able to do the race, I found some other challenges being a new mom. One of the biggest challenges was what to wear! As I didn't run during pregnancy I really wasn't sure what out of my running wardrobe would fit, My original plan was to wear shorts and and a large t shirt but a few days before the race I saw the forecast was low 50s and rain, so that outfit wasn't going to cut it. So I dug out a pair of leggings and my running jacket for rainy days. I pulled up my tights and they seemed to fit okay. Next I tried on my jacket. It barely zipped but I got it on! At two months post partum I still need to lose 25 pounds to be at my pre pregnancy weight. This generally does not bother me except when my clothes don't fit! The morning of the race I met up my friend Christina who was also running/walking the race with a friend. She drove us to the start of the race and we sat in her parked car as long as we could because we both hate getting wet! About 15 minutes before the race we decided we should actually get out of the car and head to the start: Along the way we stopped at the porta potty. After using the porta potty I felt like a runner again! We ducked into a parking garage lobby to keep dry, tie our shoes and get a pre race picture! We go out to the start and we are at the very end. This doesn't bother me as my only goal is to finish! There is a buzz in the air and I'm excited and nervous! I'm so happy to be here and can't believe I'm running a race again! Mile 1: We begin! I start running and feel the excitement of being in a race, But my start feels fast. I look down at my watch and see an 11 minute mile. That's way beyond my capabilities right now so I need to slow it down. Mile 1.5: I stop to get water. I realize that I haven't been running that long but it feels much longer. Mile 2: It's becoming obvious that my outfit was a poor choice. It's one thing to look at yourself in the mirror at home and another thing to actually go run in your outfits. My pants do not fit and keep rolling down over my post partum belly. I keep pulling them up but they will not stay up. So I grab ahold of the top my pants with my left hand and hold them up, while swinging only my right arm now. Looks like I'm going to finish this race with having to hold my pants up. Speaking of finishing I realize that I only have one mile left! I'm so use to do longer races that it didn't even dawn on me that I'm nearly done! Before crossing over the Clemente Bridge I take a walking break. I really want to run the entire bridge since running bridges (with the exception of Birmingham) are my favorite parts of the Pittsburgh races! After crossing the bridge I just have to finish the race through downtown. I can't describe how badly I wanted to stop and walk at this point but I had just a half mile left at this point and told myself I wasn't allowed to walk! Mile 3: Only .1 mile left! I'm being passsed by people on the left and right making a dash towards the finish! I wish I could sprint the finish but there's nothing left! I'm just trying to hold on until the wheels fall off! I have to admit that running a 5k two months after having my son was a bit agressive. I was no where near the shape I'm usually in for running. In fact with the exception of the days before delivery, this is the heaviest I've ever been in my life. So why run a race? Shouldn't I have waited? Two things made me want to run so soon. The first was that I missed running. I couldn't wait to do it again! I tried to imagine myself not participating in marathon weekend and that thought made me sad! I just knew I had to run! The second thing that made me run was the realization that there will never be a perfect time to start running again. My nights of interrupted sleep and exhaustion probably won't get better for a while, so why not just start now instead of waiting! My point is that if you really want to do something, don't wait for the perfect moment, just do it! I am so happy that I did! Preparing for my first post pregnancy race! I usually don't write race recaps of 5ks but this one was a pretty big deal for me. If you've read my recent blogs you are aware that I recently had my son in March! During my pregnancy I remained active, however, I did decide to give up running. This isn't to say that pregnant women should stop running. I believe that you should do what you are comfortable with during pregnancy and I was not comfortable with running so I quit for the time being. But along with that decision I really missed running! When I would see people running down the street in my neighborhood it would make me sad and I looked forward to the day I could do it again. Towards the end of my pregnancy I also developed high blood pressure for the first time in my life and had to take it easy for my health and the health of my baby. Fortunately he was born healthy and happy at 37 weeks. To be totally honest after his birth I felt like I got hit by a bus for the first two weeks. It also didn't help that my blood pressure spiked even more and I had to go on medication. This was a bit of a low point for me, going from someone that was extremely active to sitting on the couch, to having to go on medication. I definitely had a good cry about it. After two weeks I started walking short distances on my treadmill and eventually outside, pushing the stroller, I worked up to a mile. I also noticed that my blood pressure was going down on its own and I was able to drop the dosage and eventually get off medication. Then at my four week post partum appointment I was cleared to work out again! The next day I put on my running shoes and headed down my street. I felt like a fish out of water. My legs felt heavy, my breathing was labored but I was running again! As I ran I could hear the birds singing, dogs barking and watch the kids walking home from school. It was glorious! I returned to my front door elated and out of breath! I had only ran one quarter of a mile but it was a start! I started running a little farther each time and eventually ran one mile. It took me over 14 minutes but I had done it! It was now early April and the Pittsburgh marathon was coming up. Since moving to Pittsburgh in 2012 I have ran either the full or half marathon every year. Obviously both of those options were not attainable but there was a 5k held the day before the marathon. Could I do it? It seemed a lofty goal considering I had just completed my first mile with less than a month to train. My wonderful husband said to go for it! I could walk if I had to and it would be a good goal for me. So on April 9th I decided to sign up! I decided to train with a run/walk mentally. I didn't have set intervals, but would just walk when I needed a break. I worked up from 1 mile to 1.5 miles to 2 miles and then 3 miles. I was never concerned with how long it took, I just wanted to make sure I could cover the distance. I did my longest run/walk one week before race day in my neighborhood. My neighborhood has many more hills than the actual course so I knew I would be in good shape if I could complete those 3 miles. Fortunately I was able to cover the distance and in true marathon fashion, I only ran 1.5 miles the week of the race for my taper. It has been nearly two months since we brought home our baby boy from the hospital. And while I'm not willing to share these precious early moments of his life in my blog, I am more than willing to share the antics of my beloved cat since bringing home his brother. Barton has lived with us for seven years since we adopted him from a central Pennsylvania shelter. In many ways he was our 'first baby'. He has taken becoming a big brother in stride, barely batting an eye when we brought home our son from the hospital. He does remain a very curious cat. Being home on maternity leave, I've been able to capture many of these moments and, well, I'll just let the pictures speak for themselves. Is this my new bed? Well then, I'll just take this chair. I will watch brother for you Mom! If you don't pay attention to me I'm going to drink toilet water! ..... Or go into hiding. Do you still love me, Mom? I will always love you, Barton.